The China-based FAST, the world's largest single-dish radio telescope, has discovered three new pulsars, the National Astronomical Observatories of China (NAOC) said Tuesday. So far, FAST has identified a total of nine pulsars since its trial operations began in September 2016. According to Zhang Shuxin, deputy chief of the NAOC's Guizhou branch, the discovery of more pulsars will be common for FAST in the future. Li Di, chief scientist of the NAOC radio astronomy division, in an earlier interview predicted that when FAST starts formal operations in 2019, it will find more than 100 pulsars each year. Pulsar observation is very important as it can be used to confirm the existence of gravitational radiation and black holes and help solve many other major questions in physics. Located in a naturally deep and round karst depression in southwest China's Guizhou Province, FAST stands for Five-hundred-meter Aperture Spherical Radio Telescope. It has a receiving area equivalent to about 30 football fields. 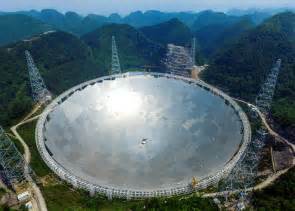 FAST's key tasks include observation of pulsars as well as exploration of interstellar molecules and interstellar communication signals.